You can find instructions on how to sign the manifesto, here. Digital Democracy and Data Commons is a pilot participatory process oriented to test a new technology to improve the digital democracy platform Decidim and to collectively imagine the data politics of the future. This pilot takes place in the context of the European project DECODE (Decentralized Citizen Owned Data Ecosystem) that aims to construct legal, technological, and socioeconomic tools that allow citizens to take back control over their data and generate more common benefits out of them. The pilot is led by the Barcelona Digital City (Barcelona City Council) and the Internet Interdisciplinary Institute of the Open University of Catalonia (Tecnopolitica and Dimmons), in collaboration with the Nexa Center of Internet & Society, Eurecat, CNRS, Dribia, aLabs, Thoughtworks and DYNE. What is the DDDC pilot? Digital Democracy and Data Commons is a pilot participatory process oriented to test a new technology to improve the digital participation platform Decidim and to collectively imagine the data politics of the future. This pilot takes place in the context of the European project DECODE (Decentralized Citizen Owned Data Ecosystems), that aims to construct legal, technological and socio-economic tools that allow citizens to take back control over their data and generate more common benefits out of them. To reveal some data about our lives to some application may not look so serious; the problem arises when those chunks of data are aggregated in our devices, services and accounts to be analyzed, shared and sold. All that information constitutes digital patterns that reveal behaviors, interests and habits of the digital society. Many actors, specially big corporations and States, use that information to surveil and influence our lives, through strategies that go from continuous advertisement to intervention in political processes (such as in the Cambridge Analytica case) up to generating citizen rankings (such as in the Chinese case). Nowadays there still is little awareness, deliberation and participation of citizens in the definition of the data politics that shape this new digital economy. This pilot initiative tries to stir critical consciousness and common construction in this arena. Furthermore, it aims to provide with the tools to build in that direction. What is DECODE and how does it relate to the DDDC process? The DDDC pilot will test the technological tools created by the DECODE project. DECODE is a European project that is creating technological, legal and socio-economic tools that allow people to have greater control over their data and obtain greater collective benefits from them. If you want to know more about the project (the partners, their funding, etc.) or about the development of the tools, you can browse the project documents on different planes, legal, socio-economic and technical (see "related documents" below), the FAQs or the official website. What are the goals of the DDDC pilot? The first is to integrate DECODE technology with the Decidim digital platform for participatory democracy, with the goal of improving it for processes involving citizen e-petitions, providing more safety, privacy, transparency and data enrichment. The second objective is to enable a deliberative space around data regulation, governance and economics, in the context of the new digital economy and public policy. The goal is to provide a vision oriented to promote a greater citizen control over data and their exploitation in commons-oriented models (that is, models where people share data and allow open use while remaining in control over it, individually and collectively). The third objective is to experiment with the construction and use of a data commons generated in the process, for improving the inclusion of the participatory process itself. This participatory pilot will have a total duration of six months and will be developed in several phases, which will run between October 18th 2018 and April 15th 2019. Throughout the process, different face-to-face meetings will be held, connected with the activity developed in the dddc.decodeproject.eu platform. Presentation & diagnosis: the first phase of the process will be dedicated to the elaboration of a brief diagnosis of the state of regulations, governance models and data economy, supported on the analyses previously developed in the context of the DECODE project. This phase will also include the launch of a sociodemographic survey which will also include various questions of perceptions on the digital economy. The data from this survey will allow, in later stages of the process, to design communicative actions aimed at improving the inclusiveness of the process. 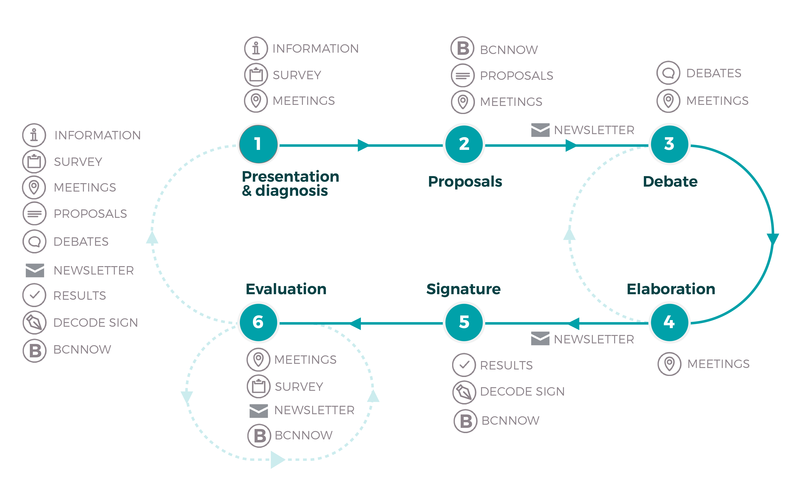 Proposals: during the second phase of the process, proposals will be collected to address the issues mapped during the diagnosis phase, including proposals derived from the previous work in DECODE. Likewise, a session of analysis of the survey sociodemographic data will be carried out, linked to the design of communicative actions to improve inclusion in the process. The Barcelona Now (BCNNOW) dashboard developed by the Eurecat team will be used for the analysis. Debate: in the third phase, proposals from the previous phase will be discussed. Elaboration: subsequently, there will be a process of elaboration of the proposals, and the discussions, by the DDDC team and interested participants. Signing: then comes a central moment in the pilot: the collection of support for the pilot results using DECODE technology for secure and transparent signature (based on encryption techniques and distributed ledger technologies). This technology, integrated with Decidim, represents a step forward in the construction of a more secure, transparent and distributed networked democracy. Evaluation: the process will end with a closing meeting and the launch of a survey that will help to assess the satisfaction of participants with the process and with the DECODE technology. Throughout these phases (especially in face-to-face meetings), discussions will be organised around three main axes: legal aspects, governance aspects, and economic aspects. Although they have clear connections between them, each of them provides a differential approach to discussions around data. One of the results of the process will be a participatory manifesto around the digital economy. A fourth axis of the pilot, the experimental axis, will be dedicated to use and take collective decisions around the database resulting from the data (in particular, the anonymized socio-demographic data) shared during the pilot, constituting a temporary commons that will serve to improve the deliberative process itself, a practice that could be incorporated in Decidim processes in the future. To take part in the construction and testing of legal, technological and socioeconomic tools oriented to construct fairer data policies, breaking with the monopolistic, surveillance models that predominate in the current data economy. To learn and share critical consciousness and deliberation around this new digital economy. To construct and experiment with digital data commons, that is, with alternative practices to those predominating today, defined by the ideas and decisions coming from the participatory process itself. You can participate both digitally - through the DECODE | DDDC platform - and face-to-face in the workshops and meetings that will take place. In the platform you will be able to find out about different participatory processes underway and see, propose, evaluate and share proposals. To do so, all you have to do is sign up at the following link. If you still have any doubts or unresolved questions, you can send your query to dddc@decodeproject.eu. Survey conducted among participants of the first phase of the DDDC pilot with the objective of increasing the inclusiveness of the process. This document includes readings associated to each of the DECODE symposium sessions, proposed by the participating speakers. The symposium took place at the Center for Contemporary Culture of Barcelona, on October 16 and 17, 2018. This document includes readings associated to each of the DECODE symposium sessions, which took place at the Center for Contemporary Culture of Barcelona, on October 16 and 17, 2018. This is Nesta’s first report for DECODE (DEcentralised Citizen Owned Data Ecosystem), an EU funded project that will create tools that put individuals in control of whether they keep their personal data private or share it for the public good. We need to think about data differently, moving away from ideas of data as a commodity to be bought and sold, and more as a common good that can deliver significant personal and public benefits. Synthetic report that diagnoses the current staet of economic activity around data. This analytical work is essential to be able to by propose in our future work economic, regulatory, and technical alternatives to the dominant, centralised and monopolistic economic models of data-driven platforms, which exploit network effects and capture rent from network externalities, thus hindering innovation and eroding citizens’ digital sovereignty. In this work we carry on two main tasks. Firstly and more importantly, we outline a preliminary framework for the democratic governance of distributed ledger technologies (or blockchains) such as DECODE. Otherwise, we focus upon the connection between social actors and DECODE technology, attending primarily to software. This document presents a survey of data entitlements, blockchain techniques to provide appropriate options for DECODE use-cases, and privacy technologies (such as Attributed Based Credentials) relevant to blockchains. This report describes the work to design the first version of the DECODE architecture. This folder gathers the documents sinthesizing the results of face to face meetings of the pilot. This document presents the structure and results of the face to face meeting of proposal production of the DDDC pilot at the Sharing Cities Summit, which took place on November 14th, 2018. Results of the first DECODE workshop, aimed to create a diagnose on regulation, economy and governance in relation to challenges within digital society. Who participates General citizenry. Experts and practitioners in data politics and economics. City council representatives.